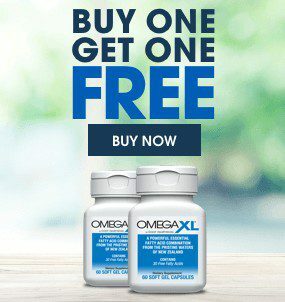 All-Natural Pain Relief is Finally Here with OmegaXL® – GUARANTEED! Satisfaction Guarantee! If for any reason you are not completely satisfied with your purchase, contact our Customer Care Department (1-800-488-8082) within 90 days of your initial order date to request a refund. (less shipping and handling) No refunds will be issued for returns after 90 days following your initial order date. Recurring auto-shipments later than 90 days after the date of your first order do not qualify for the money back guarantee and no refunds will be issued for requests received later than 90 days following the date of your first order. All Great HealthWorks’ Buy 1 Get 1 Free promotions apply to the first order only and require enrollment in our convenient auto-ship program as set forth and agreed upon at the time of the initial order. You may change your monthly recurring auto-shipment at any time by contacting our Customer Care Department. The product will be shipped following authorization of the monthly billing amount to your EFT/Credit Card account information provided at the time of your initial order. You may cancel your EFT/Credit Card by notifying us at least 10 days prior to the next billing cycle. Refunds will be returned to your account after Great HealthWorks has sufficient time to allow us and our financial institution, using commercially reasonable (but not extraordinary) efforts, to act on your notice. Your financial institution may take longer to reflect the refund transaction. For additional information on products or services, please call us toll-free at 1-800-488-8082 during our regular business hours, Monday thru Friday 9:00 AM to 6:00 PM EST. We do not accept orders from dealers, wholesalers, or customers who are resellers or intend to resell the product without our express written authorization. If we determine that you are reselling items without our authorization, we will immediately cancel your order, suspend or terminate your account, and, at our option, pursue available remedies under applicable law. Buy One, Get One FREE! 60ct Introductory Offer!